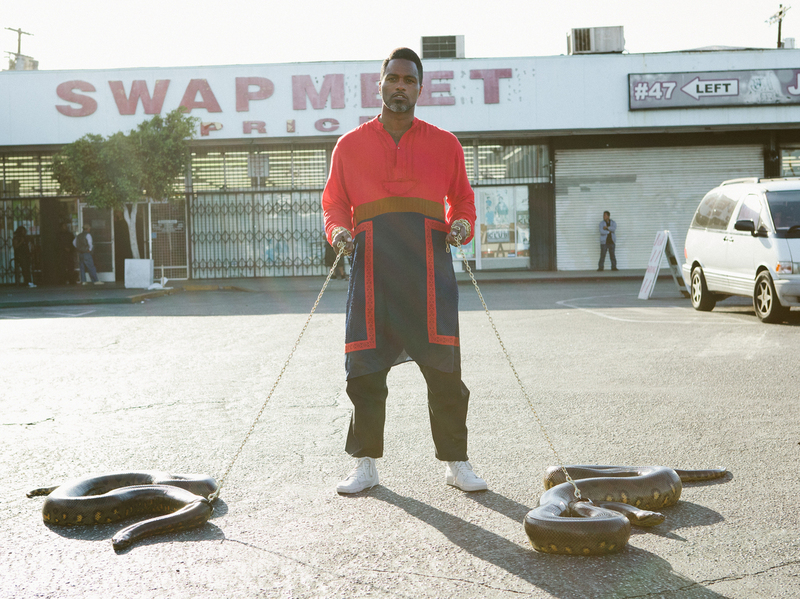 First Listen: Shabazz Palaces, 'Lese Majesty' Lese Majesty is MC and producer Ishmael Butler's most relentlessly noncommercial chapter yet. No hits, no singles; just raw, graceful tunes from the inventive former leader of Digable Planets. Shabazz Palaces' new album, Lese Majesty, comes out July 29. Audio for First Listens is no longer available after the album has been released. Broadcasting live from the land of legal weed and sliding into the frame like a giant Pacific octopus, here comes Lese Majesty, the third album from Seattle's Shabazz Palaces. It's definitely hip-hop, but... was that a drum? Human? Synthesizer? Sample of an old record? We may never know. MC and producer Ishmael Butler keeps his cards close. As leader of Digable Planets, Butler had an accessible radio hit in 1992's "Rebirth of Slick (Cool Like Dat)," but he hasn't done anything straightforward since. He began his Shabazz Palaces project in 2008, and Lese Majesty is its most relentlessly noncommercial chapter yet. No hits, no singles; just raw, graceful tunes. "Dawn in Luxor" opens the 45-minute document with a line about "throwing cocktails at the Führer," and the album's title comes from the French phrase for sacrilege against royalty. The sentiment can be interpreted in several ways, with Butler lyrically protecting what's precious to him — blackness, hip-hop, eccentricity — and going hard at oppressors. "Luxor" morphs into "Forerunner Foray," which captures the buzz of the entire hip-hop era, with prototypical rapping spliced in from 1973 and fluid, controlled jazz singing from Catherine Harris-White. She's Butler's main co-star on the album — not Tendai Maraire and his mbira, like on the last two Shabazz records. As melodic as much of Lese Majesty is, the words might be the album's most important element. Close listeners will find brilliant inventions ("plushtrous," "unstill") and plenty of quotable passages. From "They Come in Gold," a cool literary reference: "Ish dances with the white whale on the Pequod." From "Harem Aria," after a string of bizarrely simple similes: "I'm not messing with your mind / I don't have that kind of time." If you're in Seattle before Sept. 5, Butler's crew Black Constellation has an exhibit at the Frye Art Museum called Your Feast Has Ended, with textiles, sculpture, paintings and video work from Nicholas Galanin, Maikoiyo Alley-Barnes (Shabazz Palaces' video director and mask maker) and Nep Sidhu (Lese Majesty album designer). There's no better way to hear this album than while walking through the museum wearing headphones.